Knowledge acquired from microbiological studies of oral arginine metabolism over the past 40 years has recently found its way to clinical application in dentistry. Novel arginine formulations incorporated into dentifrices have proven to be effective as an approach to prevent dental caries. In oral biofilms, arginine metabolism via the arginine deiminase system (ADS) produces ammonia, which inhibits tooth demineralization by neutralizing glycolytic acids and by suppressing the emergence of a cariogenic microflora. Evidence from translational science studies suggests that arginine metabolism in oral biofilms decreases the risk for caries development. These studies have expanded the focus of caries research beyond cariogenic bacteria to health-related, ADS-positive bacteria. 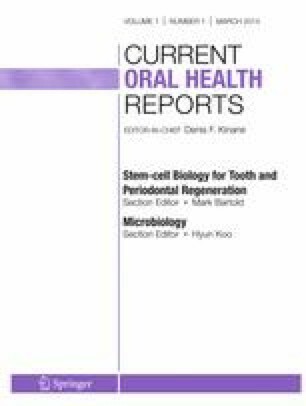 The focus of this article is on the contribution of arginine metabolism to pH homeostasis in oral biofilms and its impact on the etiology of dental caries. Oral bacteria that colonize the teeth form dental plaque, a multispecies microbial biofilm associated with the development of dental caries. A caries lesion occurs when acids produced by bacterial glycolysis of dietary carbohydrates cause demineralization of the tooth enamel. Continuous acidification of oral biofilms results in increases in the proportions of acid-producing and acid-tolerant organisms, a selective process that alters dental plaque pH homeostasis and shifts the demineralization-remineralization balance toward loss of tooth minerals. Thus, while caries is known as a multi-factorial disease, low pH is its primary determinant. Consequently, a major focus of caries research has been on identifying and characterizing acid-generating bacteria and the mechanisms of acid resistance of cariogenic bacteria. Yet, very few studies have directly examined the alkali-generating bacteria capable of effecting plaque neutralization, many of which appear critical to dental health. In particular, translational research efforts [1, 2, 3••, 4] have suggested that alkali production in the form of ammonia inhibits tooth demineralization by neutralizing glycolytic acids and by creating an environment in oral biofilms more favorable to the persistence of an alkalinogenic microflora that is compatible with dental health. Therefore, alkali production in oral biofilms is closely intertwined with microbial ecology in health and diseases. The metabolism of arginine by the arginine deiminase system (ADS) of oral bacteria results in ammonia production in plaque and contributes to the pH rise following the ingestion of carbohydrates and during fasting periods . Arginine metabolism has also been shown to significantly increase plaque pH in vitro and in vivo, even in the presence of carbohydrates. The concentration of ammonia, usually in the form of ammonium ion (NH4 +), in plaque fluid can exceed 40 mM , and a significant proportion of this ammonia can be derived from urea metabolism by ureases, as well as from some other ammonia-generating systems of oral bacteria such as amino acid deaminases [7, 8•]. However, the ADS is considered to be a major contributor to plaque ammonia content and pH homeostasis . Evidence from the early basic studies of Kleinberg and collaborators [10, 11] to more recent clinical studies correlating oral arginine metabolism and caries experience [2, 3••] suggested that providing arginine to oral biofilms could be an effective therapy for caries control. Indeed, the use of mints  and dentifrices [13-17] containing arginine was highly effective at inhibiting the initiation and progression of dental caries. This review will provide current information concerning the contribution of the ADS to pH homeostasis in oral biofilms and implications on the etiology of dental caries in the context of how arginine may positively influence the ecology of oral biofilms to foster dental health. The major sources of arginine for plaque bacteria are the diet and salivary peptides. Arginine in free form is secreted in saliva at concentrations averaging about 50 μM , and free arginine is found in mature 48-h dental plaque at approximately 200 μM . Free arginine can also be introduced into the diet in particular foods. However, much of the arginine that enters the mouth in foods, or salivary and other host secretions, is in peptide or protein form. The arginine can then be released by the variety of proteases produced by the oral microbiota into a form that can be internalized and catabolized by abundant ADS-positive bacteria. The primary route for catabolism of arginine by plaque bacteria is via the three-enzyme ADS, which initially converts arginine into citrulline and ammonia using the enzyme arginine deiminase (AD). The citrulline thus generated is acted on by a catabolic ornithine transcarbamylase (cOTC) to produce ornithine and carbamyl phosphate. A catabolic carbamate kinase (cCK) cleaves carbamyl phosphate to ammonia and CO2, concomitantly donating the phosphate to ADP to produce ATP . Ammonia production via the ADS results in cytoplasmic and environmental pH increases and benefits oral bacteria by: 1) protecting them against acid killing [7, 20]; 2) providing bioenergetic advantages that include increasing ΔpH and synthesizing ATP [7, 21]; and 3) maintaining a relatively neutral environmental pH that is less favorable for the outgrowth of cariogenic microflora [7, 22]. Arginine metabolism via the ADS is hence deemed as beneficial to ADS-positive bacteria and has a potent influence on oral biofilm pH, microbial ecology and on the initiation and progression of caries. Generally, the ADS genes are arranged in operons consisting of arcA (AD), arcB (cOTC) and arcC (cCK) . ADS operons can also harbor arcD (arginine/ornithine antiporter) and other genes encoding arginine amino peptidases and transcriptional regulators. Burne and Marquis  suggested that alkali production needs to be tightly regulated because excessive alkalinization could be lethal, or too vigorous catabolic activity by the ADS could deplete arginine supplies for protein synthesis. In fact, several regulatory mechanisms are well established for the ADS of oral bacteria. For example, arginine is required for induction of the ADS and the system is sensitive to carbon catabolite repression (CCR) in Streptococcus sanguinis, Streptococcus rattus and Streptococcus gordonii [5, 23-27]. The dependence on extracellular arginine for induction of ADS may be reduced during co-aggregation of arginolytic and non-arginolytic species . The ADS also appears to require low pH and anaerobic conditions for optimal expression in some oral streptococci [24, 26, 27]. Specific and global transcriptional regulators, multiple two-component systems and other factors have been also shown to regulate ADS activity in response to arginine and environmental signals in S. gordonii through transcriptional and post-transcriptional mechanisms [5, 24, 26, 27]. Furthermore, ammonia production via the ADS appears to be inhibited by certain antimicrobials commonly used in oral care products, such as triclosan; although fluoride was considered a poor inhibitor of the ADS at levels normally found in the oral cavity . The majority of recognized species of ADS-positive oral bacterial can be readily cultivated, and mostly consists of abundant oral streptococci: S. sanguinis, S. gordonii, S. rattus, Streptococcus parasanguinis, Streptococcus mitis, Streptococcus oralis, and Streptococcus cristatus. Some other oral bacteria are also known to express the ADS, including certain Lactobacillus species and a few spirochetes [7, 22, 30]. A human oral microbiome database (HOMD) meta-database search has shown potential “arginine deiminase” (AD) enzymes in over 130 taxa, so if the annotations of these genes are correct, the system may be present in many other oral bacteria. Although genome sequencing and other molecular techniques have revealed new levels of complexity in the cariogenic microflora and in the nature of individual bacterial species [31-35], limited attempts [36-38] have been made to identify and characterize the clinically relevant oral organisms capable of producing alkali, which by extension can potentially affect the cariogenicity of oral biofilms. While taxa/species-level identification of the arginolytic microbiota is valuable, it does not address the fact that there is significant heterogeneity within given species of oral bacteria , particularly in their abilities to moderate pH fall. Thus, the taxa/species-level identification studies need to be supported by phenotypic and functional studies to establish reliable correlations of specific organisms with health and disease. Markedly less is known about the production of alkali than is known about sugar metabolism in oral biofilms. The causal relationship between bacterial sugar metabolism and acid production by a mixed population of plaque bacteria was first described by Stephan , who also pointed out that the drop in plaque pH detected after sugar challenge is followed by a gradual rise in plaque pH that eventually reaches a plateau. Later, the plateau—or resting pH —of caries-active plaque was found to be more acidic than that of caries-free plaque , further supporting a correlation between acid production and dental caries. Subsequent studies showed that the rise in plaque pH is associated in part with ammonia production from arginine or urea by a subset of organisms present in saliva and plaque . Marquis suggested  that the buffering capacity from ammonia production in oral biofilms moderates the speed of the pH drop and allows time for the alkali-producing bacteria to adjust their physiology for survival. Kleinberg foretold  that plaque pH would be determined by the acid–base metabolism of plaque organisms, which in turn could be affected by plaque thickness, the proportions of acid-producing and alkali-producing organisms, and the relative availability of nitrogenous and carbohydrates substrates in plaque. In line with these early studies, data from a recent in vitro study showed that caries development may be influenced by the relative rates of acid and base formation in plaque, which critically depend on the presence of sucrose, the pH and buffer capacity of plaque, as well as the biofilm age . Evidence accumulated from in vitro and clinical observations provides strong support for the idea that the ADS functions to reduce the cariogenicity of oral biofilms. A study from Singer and collaborators  was the first to indicate that the ADS is active in vivo in human dental plaque. Later, the levels of free arginine in saliva of caries-free individuals were found to be significantly higher than in saliva of those with caries . This fact may explain in part why dental plaques of caries-free individuals who have fasted have elevated ammonia levels  and higher pH values compared to plaque from caries-active individuals [47-49]. Our research group has been conducting studies to differentiate caries-free and caries-active individuals on the basis of their ability to metabolize arginine via the ADS [2, 3••]. A positive correlation between ADS activity in oral biofilms and absence of caries activity has been clinically demonstrated in adults , and more recently in children [3••]. Specifically, oral bacteria from plaque of caries-free individuals present higher ADS activity compared with those from caries-active individuals. In other words, the plaque bacteria of individuals who are caries-free appear to be able to utilize arginine to neutralize plaque acids more effectively than plaque bacteria of those who are experiencing caries. When the arginolytic potential of bacteria collected from site-specific supragingival plaque was investigated in children [3••], it was observed that plaque bacteria colonizing tooth surfaces without carious lesions presented with a significantly greater capacity to metabolize arginine compared with plaque bacteria of carious lesions. Notwithstanding, an extremely high degree of variability in ADS activity among plaque samples was also observed, in some cases greater than 10,000-fold. Together, the findings from this study [3••] support two linked hypotheses: 1) alkali production via the ADS contributes to plaque pH homeostasis—an equilibrium of the bacterial acid–base metabolism—typical of dental health; and thus, 2) an individual or a tooth surface may be at higher risk for caries when there is a deficiency in alkali production via the ADS to counteract acid production from sugar metabolism. One would expect that differences in the microbial composition of oral biofilms could be the most likely factor to affect the capacity of oral samples from different individuals and different tooth surfaces to metabolize arginine. Reduced ADS activity would appear to be due to low levels, or absence of, ADS-positive bacteria in oral biofilms. This would be predicted based on what is currently understood about caries and microbial ecology, simply because the proportions of acid tolerant and acidogenic species increase in cariogenic biofilms, which must occur at the expense of other species. However, the use of qPCR  did not reveal a statistically significant association between the proportions of two recognized arginolytic species, S. sanguinis and S. gordonii, and the caries status of adults. These results suggested that the diminution in ADS activity associated with caries experience may not be due only to lower proportions of known ADS-positive bacteria, and also raised the possibility that species other than those examined in that study may contribute to the overall oral ADS activity. Conversely, as the diversity of the oral microbiota associated with health and disease is beginning to be described by high-throughput methodologies [31-33, 35, 50-52], certain ADS-positive streptococci are underrepresented in cariogenic oral biofilms and consistently associated with dental health. For example, Gross and collaborators  used 16sRNA gene sequencing to investigate the bacterial community profiles associated with the progression of caries and with health. S. sanguinis were found at significantly higher levels in health as compared to the more advanced stages of caries, and S. gordonii and S. cristatus were found at higher levels in subjects with caries that did not progress as compared to those whose caries progressed . Certainly, there is a critical need to more thoroughly characterize the organisms that contribute to arginolysis in the oral cavity. A preliminary study  aimed to isolate and identify arginolytic bacterial strains from plaque samples. The majority of the ADS-positive bacterial species identified were strains of S. sanguinis and S. gordonii, but additional cultivable taxa such as species of Actinomyces, Bacillus, and Neisseria were also found to contribute to the total oral arginolysis. This study also examined the heterogeneity of the arginolytic strains in terms of differential sensitivity of the ADS to induction or repression by environmental factors. The results revealed a considerable spectrum of responses of the ADS to multiple environmental stimuli. The ADS of clinical strains was demonstrated to be regulated in response to those environmental factors that have the greatest impact on the composition and biochemical activities of supragingival biofilms—availability and source of carbohydrate, low pH and oxygen—and that are all well-recognized environmental factors that can influence the development of caries. It is therefore possible that the basis for differences in arginolysis observed between caries-free and caries-active individuals can be associated with: 1) the carriage in oral biofilms of strains that have inherent differences in the regulation of the ADS by environmental factors; and/or 2) host and biofilm micro-environmental factors that affect ADS expression or activity in vivo. For example, the microenvironments in biofilms of caries-active individuals may not be conducive to high ADS expression or may contain inhibitory factors that decrease ADS expression or enzyme activity. Clearly, arginolytic clinical strains with constitutionally high ADS-expressing phenotypes and those in which ADS expression is insensitive to conditions known to cause caries—sugar availability and acidic environment—may have great potential in probiotic therapies to prevent and control dental caries. Future studies should assess whether there are associations of particular ADS-positive isolates having beneficial properties with health, or particular isolates having undesirable properties—aciduricity, poor arginolysis, poor antagonism against cariogenic organisms—with disease. Of note, the manipulation of ADS genes to produce strains of oral streptococci able to modulate the cariogenic potential of dental plaque has been previously proposed by Burne and collaborators . They suggested that these strains could be developed either by engineering high ADS-expressing strains from organisms that normally possess the system, or through the introduction of the ADS genes into the caries pathogen Streptococcus mutans, which normally lacks the system. Besides the ADS pathway, arginine can be enzymatically converted to agmatine. Agmatine can be produced from arginine by plaque bacteria that express the enzyme arginine decarboxylase (ADC), and agmatine can also be introduced into the oral cavity in a variety of foodstuffs . Oral agmatine can be catabolized in a very similar manner as arginine by the ADS via the agmatine deiminase system (AgDS). Specifically, agmatine is acted on by agmatine deiminase to produce carbamylputrescine and one molecule of ammonia. Enzymes of the AgDS, which are similar to the cOTC and CK enzymes of the ADS, can then convert carbamylputrescine to putrescine, CO2, and ammonia while generating one molecule of ATP per molecule of agmatine catabolized [55, 56]. As with the ADS of other plaque streptococci, the AgDS of S. mutans contributes to ∆pH by raising ammonia liberation in the cytoplasm and provides ATP, thereby contributing to acid tolerance . However, the AgDS activity in oral biofilms is generally lower than that of ADS , and ammonia production from agmatine probably does not result in significant alkalinization of the environment, in contrast to arginine catabolism via the ADS [55, 56]. Importantly, agmatine is inhibitory to the growth of S. mutans and AgDS activity is required for optimal growth of this organism in the presence of agmatine . Thus, it has been proposed that the ability of the AgDS to detoxify and catabolize agmatine may augment the survival and cariogenic potential of certain bacteria, like S. mutans. Also of note, the AgDS is absent or only very poorly expressed in many of the plaque streptococci that have been most closely associated with dental health. Even though the major route for arginine breakdown is the ADS [42, 58, 59], ADC and subsequently AgDS activities may be prominent in certain plaque samples. If this is the case, ADC and AgDS activities would have the effect of shifting catabolism of arginine away from a beneficial pathway, the ADS, to be catabolized by a pathway that may be more beneficial to caries pathogens, thus further shifting the balance from health to caries disease. It remains to be carefully tested whether oral biofilms of caries-free individuals have a greater capacity to metabolize arginine via ADS and lower capacity to metabolize agmatine via the AgDS compared to those from caries-active individuals. A better understanding of the constitutional acid tolerance of certain arginolytic strains may help to explain the contribution of the ADS and AgDS to the ecology of oral biofilms. As previously mentioned, the ADS and AgDS are strongly protective against the effects of low pH [20, 55]. Work by van Houte, Beighton and others has revealed an association of non-mutans “low pH” bacteria, including streptococci, Actinomyces, Bifidobacterium/Scardovia and lactobacilli, with caries, and some of these species possess the ADS [31, 50, 60-65]. We propose that there is an inverse relationship between the levels of ADS and AgDS expression and the ability to tolerate and grow at low pH in the absence of arginine and agmatine, respectively. In fact, such associations are evident with groups of streptococci. For example, S. rattus is generally recognized as poorly cariogenic and not particularly acid tolerant, while it is the only member of the mutans group of streptococci that possesses the ADS. Therefore, there may be sub-groups of known “commensals” that are highly aciduric but insufficiently alkalinogenic to moderate oral biofilm acidification, and therefore are cariogenic. The capacity to differentiate these “commensals” from healthy organisms will immediately add clarity to the complex acid-base relationships in the oral microbiome. The effectiveness of the arginine metabolism on regulation of plaque pH seems to depend mostly on the availability of the arginine to act as an inducer and as a substrate for the ADS. A technology designed by Kleinberg  targeted to deliver arginine for ammonia production by plaque bacteria. This technology, when incorporated into mints or dentifrices, was demonstrated clinically to be successful in inhibiting caries initiation and progression in children at high risk for caries [12, 13]. Thus far, only fluoride was considered clinically effective in preventing and reversing the caries process by favoring tooth remineralization during acidification from sugar metabolism. The mechanisms of action of arginine appear to complement that of fluoride by directly influencing pH while impacting the composition of oral biofilms. A clinical study tested the hypothesis that increased availability of arginine in the oral environment through an exogenous source enhances the ADS activity levels in dental plaque and favorably influences the composition of the oral microbiome . In this study, the use of a fluoride-free dentifrice containing arginine significantly increased ADS activity in plaque of caries-active individuals. The plaque microbial profiles of caries-active individuals treated with the arginine toothpaste also showed evidence of a shift in composition to that more similar to a health-associated community, i.e. more similar to that of caries-free individuals, as demonstrated by analyses using the Human Oral Microbe Identification Microarray (HOMIM). While these studies are preliminary and need to be confirmed with larger sample sizes, they point to the idea that an anti-caries effect may be expected from arginine-based formulations due in part to its ability to enhance ADS activity levels. If that is the case, then the beneficial effects could be realized from enhancement of arginine metabolism from salivary sources during fasting periods, which could favor tooth remineralization. Further, the higher resting plaque pH would translate to less extreme acidification of plaque when challenged with carbohydrates. And finally, continued enhancement of arginine metabolism should eventually lead to changes in, or stabilization of, the composition of the oral microbiome that would be beneficial to the host and selective against caries pathogens. A series of clinical studies have recently confirmed the hypothesis that supplementation of arginine to plaque bacteria can be effective against caries [14-17]. In these studies, an optimized formulation containing arginine and fluoride and incorporated into a new dentifrice was proven to be significantly more effective in controlling caries in children than a dentifrice containing fluoride alone [14-17]. While these findings may have substantial public health benefits, the research community is now challenged by the fact that much remains to be investigated with respect to the effects of these novel arginine-based oral care technologies on the composition, gene expression profiles and biochemical activities of the oral microbiota. Arginine metabolism via the ADS contributes to pH homeostasis in oral biofilms and reduces the risk for development of carious lesions. Consequently, protection against dental caries may be achieved by increasing the alkali-generating capacity of dental plaque via arginine metabolism. An anti-caries effect may be expected from novel arginine-based oral care technologies due, in large part, to the ability of arginine to serve as an inducer of the ADS and a substrate for ammonia production by plaque bacteria. In addition, oral care products containing arginine may also enhance the ability of plaque bacteria to produce ammonia from naturally occurring substrates in saliva. Future studies should continue to dissect the underlying molecular basis for the individual and caries-related differences in arginolysis, ultimately allowing for the identification of individuals at greater risk for dental caries. Such experiments will expand the knowledge on the diversity of the oral alkali-generating bacteria and their role in oral health and disease. The authors thank Drs. Floyd Dewhirst and Jorge Frias-Lopez from the Forsyth Institute for their valuable insights on the HOMD search of potential ADS-positive bacteria. Some of the work cited here has been supported by a grant from Colgate-Palmolive, which holds a patent for the novel arginine-based technology. Both authors have consulted for Colgate-Palmolive on an ad hoc basis. Dr. Marcelle M. Nascimento has received a grant and consulting fee or honorarium from Colgate-Palmolive. Dr. Burne has 452 received a grant from NIH and honoraria for speaking at universities. Nascimento MM, Browngardt C, Xiaohui X, Klepac-Ceraj V, Paster BJ, Burne RA. The effect of arginine on oral biofilm communities. Mol Oral Microbiol. 2013. doi: 10.1111/omi.12044.